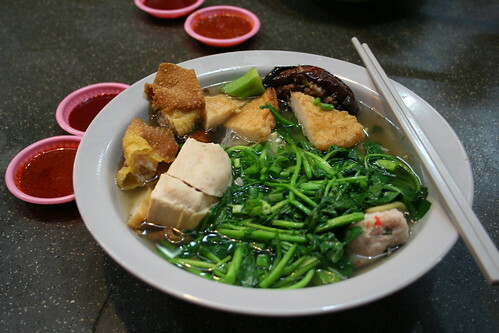 Anyone who knows me well, knows that I LOVE Yong Tau Foo. It doesn’t matter which variety: regular YTF, Ampang YTF, Hakka YTF; I love them all. If my surname was Yong, I’d name my child Tau Foo, just as a tribute. Yong Tau Foo (which is the Cantonese pronunciation, Mandarin “niang dou fu”—thanks, Van!) literally means “stuffed tofu,” with the stuffing made out of fish paste, although sometimes, it’s mixed with pork. Somewhere along the line, someone must’ve figured out that you can stuff pretty much anything with the mixture; and now, you have stuffed brinjal/eggplant, chillies, bean curd ‘puffs’ (tau pok), lady’s fingers (okra), bittergourd, mushrooms, etc. 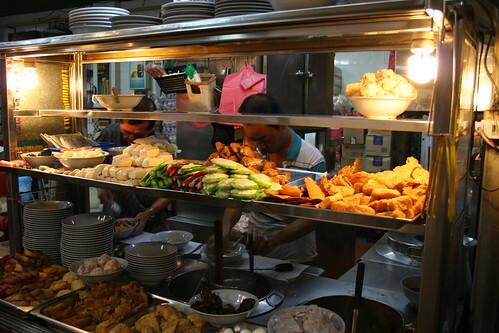 There are also deep-fried items like wantons and bean curd skin, as well as meatballs, cuttlefish and sausage-like things. Finally, you can also add vegetables, together with noodles of your choice. Order pegs with table numbers on them. Clipped to your bowl after you choose your items. Although this is supposed to be Hakka YTF, it neither comes with yellow noodles, nor does it come as a fixed selection of items. 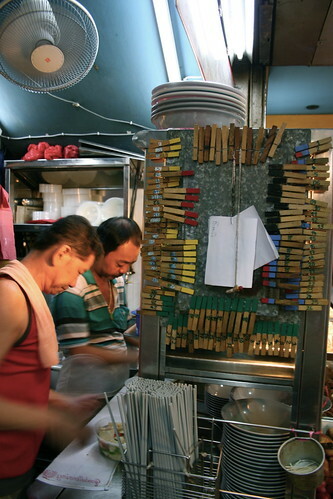 Here, you can pick any number of items, and you can have it dry, in a clear broth, or with laksa soup. Take a bowl, fill ‘er up, and enjoy! My order will almost always have two pieces of brinjal (Best brinjal you’ll ever taste in YTF. Deep fried and delicious. ), two lady’s fingers, and two slices of bittergourd. The other four pieces depends on my mood. But the soup choice is pretty much a given: clear broth, with watercress. The flavour of the watercress permeates the soup, making it richer and more complex. Full-bodied. With hints of arugula. It’s good, trust me. My seven-year-old niece, who’s a finicky eater, had some tonight and proclaimed, “it’s tasty!” Praise doesn’t come any higher than that. If you get ten pieces or more, it’ll come to the table in a bowl the size of a small basin. Oh, just one last thing. If you go late at night, and happen to be at a table next to the old man with one full, and 11 empty bottles of Tiger Beer, and he’s calling out to you really loudly in goodness-only-knows what dialect, don’t worry. He’s a harmless fixture there. Just wave and smile. And tell him I sent you. 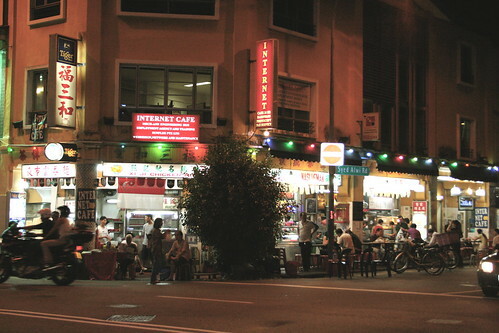 The satay here is also worth trying, in particular the pork satay. They give you the old-style Chinese peanut sauce that’s pretty rare these days, with minced pineapple in it. 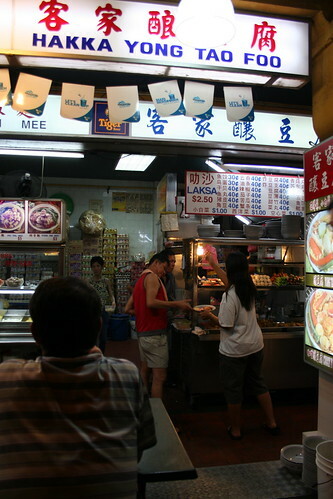 This entry was posted on Saturday, 18 August 2007 at 11:48 pm and is filed under Food, Singapore. You can follow any responses to this entry through the RSS 2.0 feed. You can leave a response, or trackback from your own site. Brudder, your camera takes pretty good night shots (and makes the YTF look so damn good). Which one do you have? And I’m glad your surname isn’t Yong! Kesian anak lu! Hi Michelle, I didn’t know they closed! I haven’t been in a while; because of the MRT line construction, the traffic and parking has been terrible. Let us know if you find out where they’ve gone to. Need to do a “Makan Places Lost and Found” on it!